Damian Lewis, who was born and brought up in the village but now lives in London, launched his “Running for Rubicon” campaign last May to raise funds for Team Rubicon UK – a charity that unites the skills of military veterans with first responders to deploy emergency response teams to disasters in the UK and overseas. He gained first-hand experience when he spent two weeks as a volunteer in the British Virgin Islands in the aftermath of the 2017 hurricanes. As a runner with Bromsgrove and Redditch AC since the age of 10, Damian based his campaign around running, with team or individual events every month. These have included a Tough Mudder, stair running, a Wolf Run, 165km Santa Run and a 24-hour Round The World relay involving 60 runners around the world. A highlight was completing the Three Peaks Challenge in 24 hours with a 19-strong team who climbed Ben Nevis, Scafell Pike and Snowdon, finishing with just 10 minutes to spare. Damian included three solo challenges “to gain a personal sense of what it feels like to be broken and then keep going, and to raise awareness of the fact that’s what survivors of and responders to disasters do all the time”. One was a marathon in the Sierra Nevada in July, which he completed in seven hours despite never having run a marathon nor done any fell running or climbing. 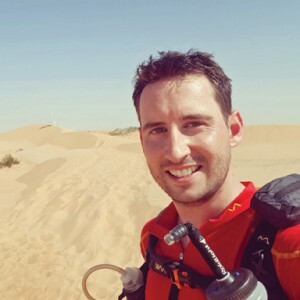 In November he travelled to Oman for the desert Ultramarathon, running 165km over five days carrying sleeping gear, safety equipment (including an anti-venom pump!) and food. Damian’s ultimate challenge comes in April when he will attempt the famous Marathon des Sables. Competitors run 260km in the Sahara desert over six days, again carrying all their own equipment and food.